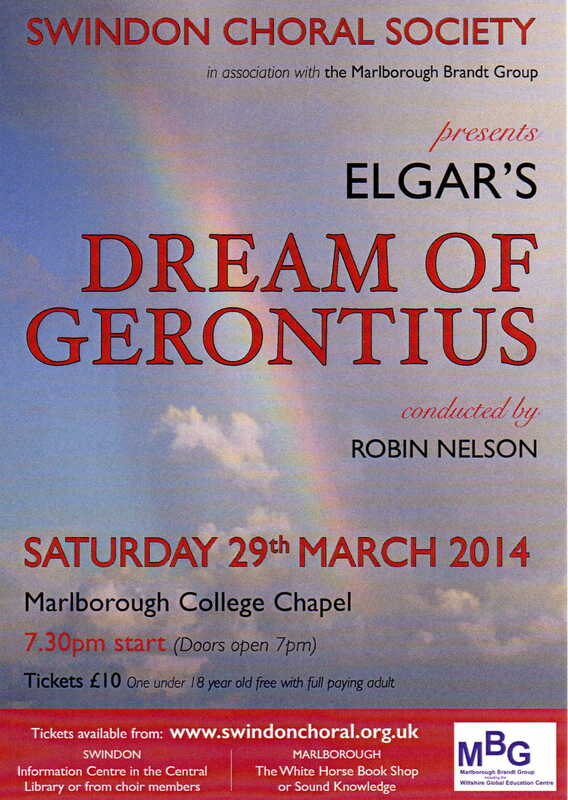 One can only hope that the soul of Edward Elgar, which could hardly have spent much time in the purgatory of Cardinal Newman's poem, was, from the "Holiest in the Height", present last night in Marlborough College Chapel to hear a remarkable performance of his Dream of Gerontius sung by the Swindon Choral Society with the Oxford Symphony Orchestra under the baton of conductor Robin Nelson. James Oxley brought to the part of Gerontius, sung without score, and with an extraordinary quality of musicianship, a considerable drama as he moved around the Chapel sharing with the audience the agony of contemplation of his death "Pray for me O my friends; a visitant is knocking his dire summons at my door, the like of whom, to scare me and to daunt, has never, never come to me before" and the final acceptance "Into thy hands O Lord, into thy hands...." moving slowly in the direction of the great West door of the Chapel. And then, as the soul of Gerontius, sits with painful, soft humility on a nearby pew "....I go before my judge" Gaynor Keeble as the Angel and Quentin Hayes as the Priest and the Angel of the Agony, supported the drama magnificently and again brought an operatic quality to the evening which the journey by Gerontius from life to death deserved. What voices! What drama! What emotion! What a privilege to share! And what a building in which to share it! Elgar must have heard! Robin Nelson had the Choir singing at their best which was exceptionally good with a great balance between the upper and lower parts. They exhibited ensemble singing at its best in the contemplative passages "Kyrie Eleison, Holy Mary Pray for Him" and in contrast clear diction in the remarkable fortissimo passages as the demons taunt the Soul of Gerontius as he journeys towards the House of Judgement with "Low born clods of earth they aspire to become Gods...!" and as the Choir of Angelicals providing the chorale like interludes of a Bach Passion "Praise to the Holiest in the height and in the depth be praise". Swindon has a choir comparable to any in the land and we are fortunate to have them in Wiltshire! And all this accompanied by the Oxford Symphony Orchestra who reflected the drama magnificently from the quiet contemplative strings to the tutti sections with full woodwind, brass and tympani we were left breathless. It is said that there had been delays in the work's composition and publication and that this coupled with the death of the young and dynamic conductor Charles Swinnerton Heap who had been destined to conduct the first performance meant that it was "under-rehearsed and chaotic" and subsequently received bad reviews. This led Elgar who had written it from his "insidest inside" "this is the best of me.....if anything of mine is worth your memory, it is this" to write, following that first performance "I always said God was against art.....!" There was no evidence that God was against art in last night's performance which was outstanding and this member of the audience left Marlborough College Chapel, moved as much by the work as by its performance.